Aikido is a form of physical, mental and spiritual education. The name, Aikido, translates as the way (do) to blend or harmonize with (ai) the spirit or nature (ki). Thus the name points toward the art’s underlying principle, which is to blend with any attack, while retaining one’s own balance and thus finding harmony even within conflict. 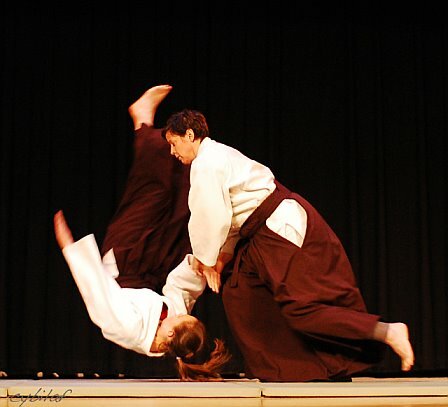 In Aikido, one relies on the study of techniques such as throws, joint locks or nerve strikes to meet any attack with a minimum of effort. The mind of the practitioner should be flexible, calm and focused and the techniques should flow out of a sense of timing, grace and balance. This ability to harmonize with one’s opponent will, through hard training, lead to a greater sense of harmony within oneself and one’s environment and the world. Our lineage of Aikido stems from the techniques of the Yoshinkan and its headmaster, the late Gozo Shioda Kancho, as they were handed down to him by Morihei Ueshiba, Aikido’s founder. This style follows Ueshiba Sensei’s earlier teachings and has stayed close to its roots of Daito Ryu Jujitsu, while incorporating the founder’s spiritual outlook. The Yoshinkan’s emphasis on fluid and focused, yet also highly practical and efficient techniques makes this style ideal as a form of physical education, as well as self-defense. Michael Esmailzadeh Sensei is grateful for the many years of Aikido instruction he received from Toshishiro Obata Kaiso, who was an uchi-deshi (live-in student) at the Yoshinkan under Gozo Shioda Kancho.